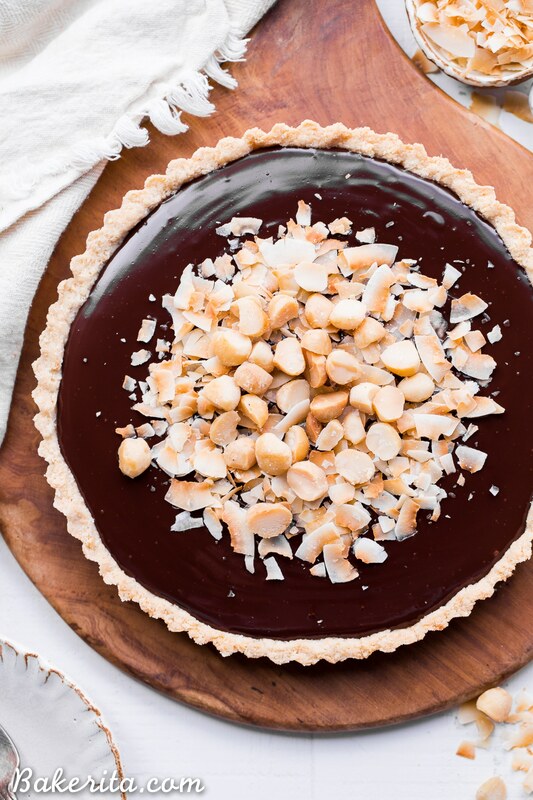 This Dark Chocolate, Coconut & Macadamia Nut Tart is decadent, delicious and easy to make. It has a coconut crust that’s filled with a luscious chocolate ganache and topped with toasted coconut and macadamia nuts. You’d never guess that this nutty tart is gluten-free, vegan, Paleo, and refined sugar-free! *2018 Update* Hi there friends, I’m back with another recipe re-make! 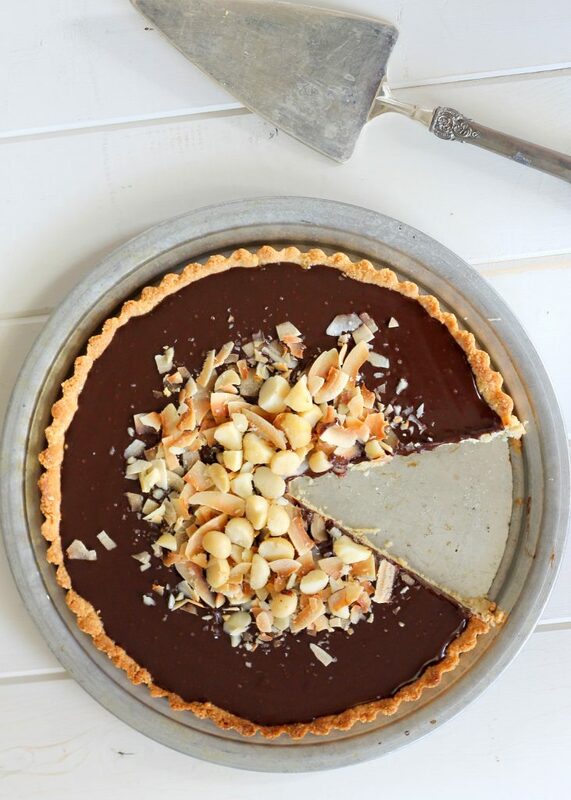 This Dark Chocolate, Coconut & Macadamia Nut Tart was originally posted on July 1st, 2013 – a whole 5 years ago, when I had just finished up my sophomore year of college. Woah. This recipe is just as good as I remembered it being – lusciously decadent and creamy, with an amazing coconutty crust and an irresistible crunchy topping. Don’t forget the flaky sea salt on top! ;) As usual, I kept the text below from when I originally posted the recipe. Hope you guys enjoy rediscovering this one as much as I have! Sometimes you’ll come across a recipe that so darn decadent, there’s absolutely no way that it can be healthy. And usually, you’re right. Most super decadent desserts are not only loaded with calories, but with unhealthy fats, refined sugar, gluten-filled grains, and empty carbs. Unfortunately, that eliminates so many people from enjoying them, because so many people have food restrictions and have to follow diets like gluten-free, paleo, egg free, and so many more. Thankfully, this recipe is gluten free, grain free, vegan, paleo, and refined sugar-free – so all the friends can have some! 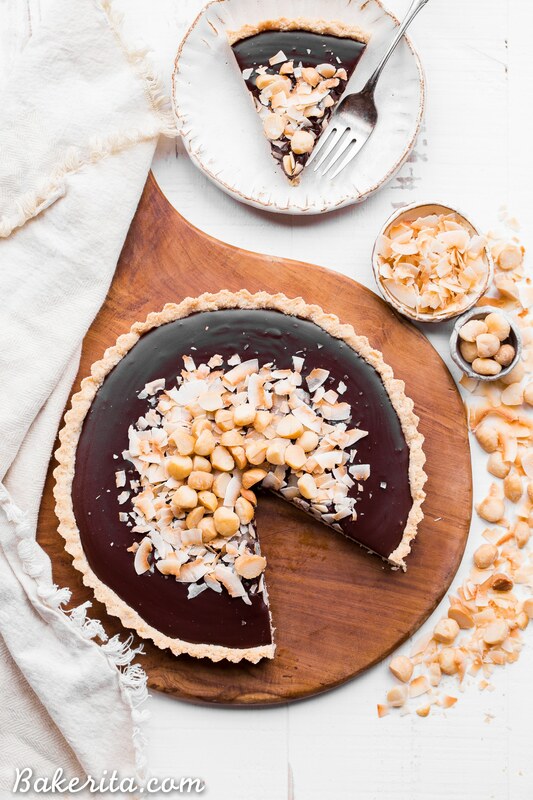 Due to the nut-based crust and chocolate filling, it isn’t low calorie or fat-free, but I can guarantee it’s healthier and better for you than a majority of the sugar-filled chocolate tarts out there and isn’t any less delicious! This tart is sooo rich and a tiny slice definitely goes a long way. The thick chocolate filling is dark, deep, and decadent. The crust is nutty and coconutty while staying crunchy and tender. 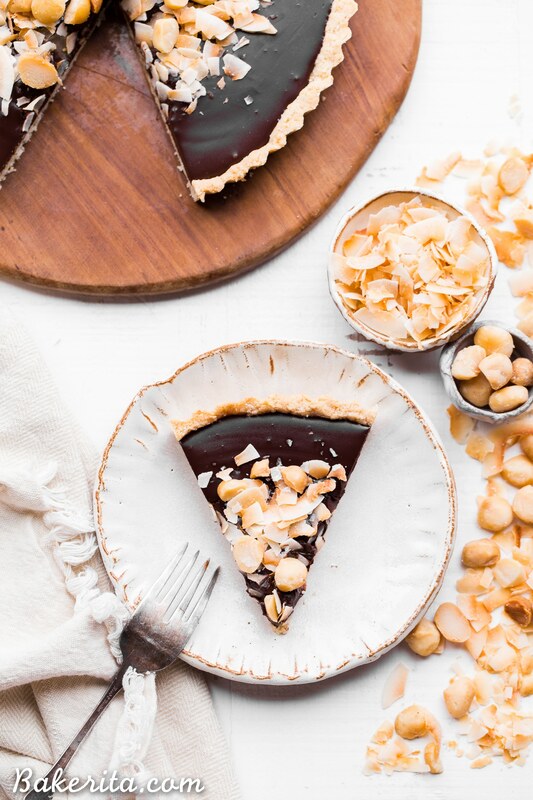 The macadamia nut and toasted coconut topping adds the perfect bit of crunch and tropical-ness to the tart. It’s easy, sweet, decadent, gorgeous, and impressive. And not loaded with all that bad-for-you stuff. What’s not to love?! 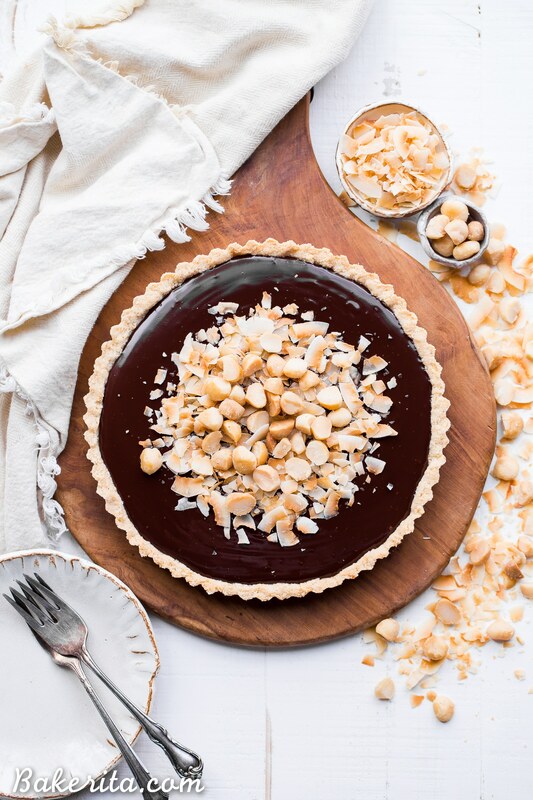 This Dark Chocolate, Coconut & Macadamia Nut Tart is decadent, delicious and easy to make. 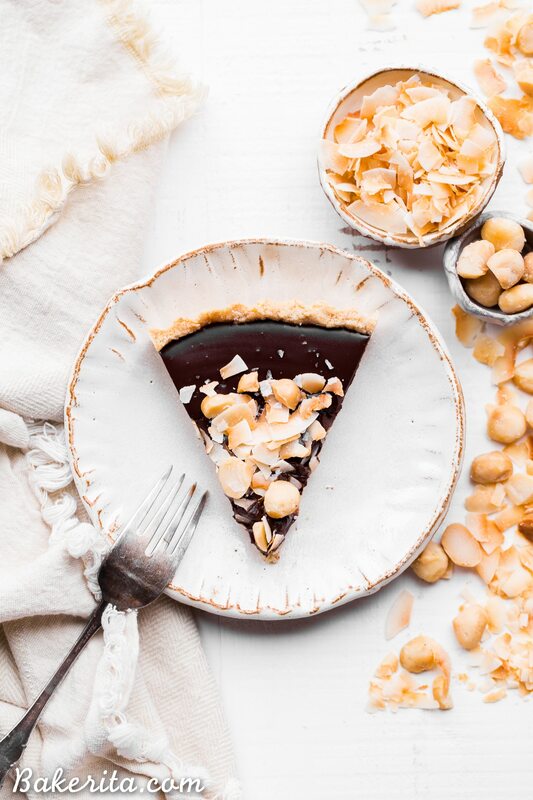 It has a coconut crust that's filled with a luscious chocolate ganache and topped with toasted coconut and macadamia nuts. You'd never guess that this nutty tart is gluten-free, vegan, Paleo, and refined sugar-free! Preheat the oven to 350ºF and grease a 9-inch tart pan with a removable bottom. In mixing bowl, stir together the almond flour and shredded coconut until combined. Melt together coconut oil and maple syrup, stir in the salt, and add to almond flour and coconut mixture. Mix until it comes together and sticks together when pinched between your fingers. Transfer dough prepared pan. Using a measuring cup or your fingers, evenly press dough in bottom and up sides of the pan. Bake the crust until golden and firm, about 12-15 minutes. Transfer to a wire rack to cool completely. After the crust is out of the oven, spread the chopped macadamia nuts and shredded coconut evenly over a sheet pan and bake until lightly golden (about 5-8 minutes in my oven). Set aside and let cool. Meanwhile, while the crust cools, place finely chopped chocolate in a large bowl. In a small saucepan, just bring coconut milk to a boil. Pour hot coconut milk over chocolate and let stand 1 minute, then stir until smooth and creamy. Stir in salt. Pour warm chocolate mixture into cooled tart shell. Lightly sprinkle toasted macadamia nuts and toasted coconut on the top. Sprinkle with a pinch of flaky sea salt, if desired. Chill for at least two hours or until set, and serve. Store leftovers tightly sealed in the refrigerator for up to 1 week, or in the freezer for longer-term storage. I have no willpower when it comes to macadamia nuts. Seriously look delicious! This tart looks so sinful I don’t anyone will know it’s actually healthier for you then the other subpar chocolate tarts. Can’t wait to make this. This is absolutely amazing! And couldn’t be prettier!! This tart is absolutely gorgeous! Love, love, Love It! This is so beautiful! I am loving all the coconut goodness with rich chocolate. Divine! Your tart is so pretty! I love love love the coconut and all those macadamia nuts! This tart looks so sinful, so I was surprised (and impressed!) to see how relatively wholesome the ingredients are. This is a great one to keep in mind! These look heavenly! Chocolate is the best thing ever :)! Love that macadamia and coconut topping! What a beautiful tart! It’s awesome that something so decadent can be healthy at the same time. Beautiful!! And who needs lo-cal when you have so much else going on? This tart is AWESOME. Wow, can’t wait to read your post! Thanks so much for making and posting about it. absolutely beautiful – I love this idea! Beautiful photos! And a beautiful tart! It looks so rich and decadent–I am craving chocolate now! I’m sure low-fat canned coconut milk would work, but I haven’t tried it myself so I can’t guarantee it! If you try it, I’d love to hear if it worked! Thanks for stopping by. This was a great tart! Made it as an experiment for a birthday party. I used hazelnuts on top instead of macadamia nuts, and I put some hazelnuts in the crust as well. It was very rich. I wonder if you could increase the ratio of coconut cream to chocolate and still have it set? Overall, thanks for a beautiful tart. Would you be able to post the nutrition info for this? Hi Amy, a good recipe nutritional calculator is available here if you’d like to know the information. oh my god this looks gorgeous!!! def thinking about making it for the holidays :) beautiful pics girrrl! You could, but I recommend lining the pan with parchment or aluminum foil so that you’re able to remove the tart from that pan. A 9×9 square pan would probably work best, size wise! Looks amazing! Can’t wait to try! Quick question: is the recipe tested with cup or gram measurements? I only ask because 12oz of chocolate don’t equal 280g, it would be more. Hi M, you’re right! Sorry about that. I tested the recipe using ounces, so 12 oz., or 340 grams is the correct amount. I’ll update the recipe to correct the mistake. Thanks for pointing it out. I love gluten free foods and macadamia nuts. Wonderful post. I made the tart and it is lovely to look at. However, the crust got soft as it sat. I made it the night before and by the morning, the crust was not crisp. There should be an instruction as to how long in advance the tart can be made without losing the flaky texture. I found that coconut cream worked better than coconut milk. I made two tarts, one with canned coconut milk and the other with canned coconut cream. The coconut cream had a nicer consistency. I have just made you recipe in small tartles. The first 2 crumbled, then I did them thicker and use more fat in the forms, they turn out beautiful and delicious. Thank you so much. I’m so glad you enjoyed the tarts, Monica!! I have a friend who is coming to dinner tomorrow night who is doing no sugar or flour, so I made this (using some hazelnuts and almonds and coconut flour). I have put a lot of effort and expense into making this. Anyway, my question is this: since she said she is doing no sugar, I used unsweetened chocolate instead of bittersweet because it has absolutely no sugar. Will it still be edible, or is it just going to be bitter and nasty. The ganache tasted very bitter when I tasted it as it was going into the crust, but Im hoping with the crust and the nuts and coconut topping it will be ok? Help? Hi Erica, unsweetened chocolate is way more bitter than bittersweet chocolate, and because this tart doesn’t have a lot of added sugar, the tart will definitely be pretty bitter and probably not very good. It typically isn’t recommended to use unsweetened chocolate unless a recipe specifically calls for it because of this. I’m not sure how to revive the tart since the chocolate filling will be so bitter. If you try making it again and need to use unsweetened chocolate, I would recommend adding a few drops of stevia (to taste) to keep it no-sugar without all the bitterness. I’ve made this tart now 3 times, and every time people rave about it!!! It so amazing, just like a coconut fudge. I am doing paleo and this was the pie i chose for thanksgiving, birthdays, ect. Everyone begs me for the recipe. Thank you for this! It’s truly amazing! Hi! Is it possible to replace the almond flour with other gluten-free flours? I haven’t tried it with anything but almond flour, so I can’t make any guarantees. Another nut flour should work, and a GF AP flour probably would too. Let me know how it turns out – Enjoy Ankia! Quick question– this is my first attempt at this type of baking, and I’m wondering if coconut milk in a refrigerated carton can replace the canned, or if there’s a difference? Thanks so much– I’m excited to make this! Hi Sherry, yes there is definitely a difference. Canned coconut milk should just be made with one ingredient: coconut. From the carton is usually very watered down and has lots of additives. I’d recommend seeking out the canned version for the best results! I’ve made this before and it was delicious. However I’ve made it the day of. I’m wondering if I can make this the night before? Yes it should be just fine to make the night before. Enjoy! This is gorgeous!! I LOVE all things with macadamia nuts! Can I swap the maple syrup to coconut sugar? Hi Marilla – no, you can’t because there won’t be enough moisture to hold the crust together without it. You could sub another liquid sweetener, like honey or agave though.